Do-It-Yourself solutions are all the rage at the moment. A homemade cleaning solution can be a safe, easy to make, and a cost effective option for keeping your home clean. Here are a few things you should know about homemade cleaning solution before you dive in. 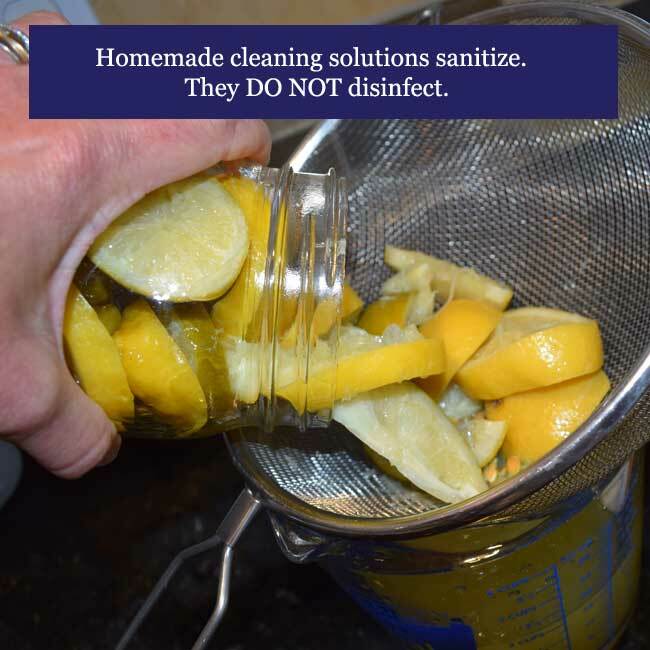 Homemade Cleaning Solutions Sanitize, but Don’t Disinfect. A homemade cleaning solution is not going to disinfect your hard surfaces. Disinfection refers to killing all organisms and bacteria on a flat surface. To do a true disinfection you’re going to have to break out the bleach. 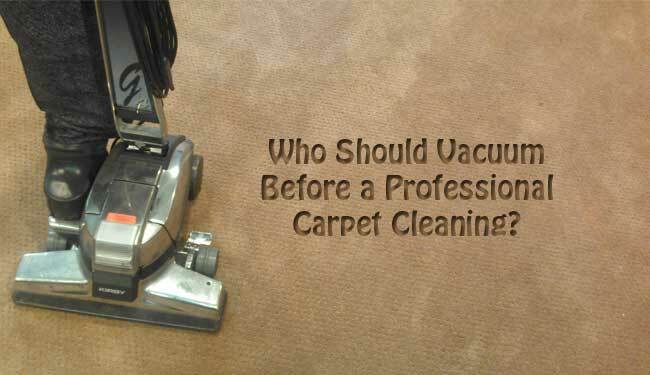 There are no approved methods of disinfecting a three dimensional surface (like carpet or upholstery). A homemade cleaning solution will help to sanitize your hard surfaces, like tile, stainless steel and glass. This means the amount of bacteria, fungi and viruses will be reduced, not eliminated. There are a variety of recipes available to make your own homemade cleaning solution. 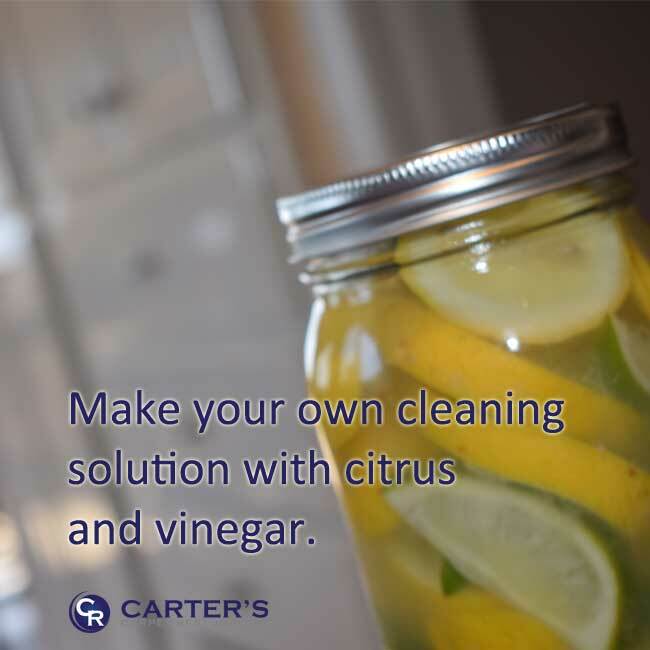 What you should know is that vinegar and/or citrus are the main “workhorses” in a homemade cleaning solution. Don’t exclude them in your recipe. They offer acid which helps remove food spills and other substances on your hard surfaces – eliminating the places for bacteria to live. Other ingredients like rosemary or lavender can offer a pleasing scent. Making your own homemade cleaning solution may save you a small amount of money, but not a lot. A basic recipe may include vinegar and lemons, costing less than $3.00 for all the ingredients. A regular bottle of Windex or Clorox Clean-Up will typically set you back $5. Take the time to do a test spot. Generally speaking, a homemade cleaning solution is safe and non-toxic. However, you don’t always know how it will react with your hard surfaces. Always do a test spot in an inconspicuous location to ensure there will not be a reaction between your homemade cleaning solution and your hard surface. Sometimes engineered wood or vinyl flooring may have a sealant coating that is sensitive to the acid in your cleaning solution. You should also know that natural stone can be permanently etched by acid. Always do a test spot. Always. A citrus-based homemade cleaning solution should NOT be used on upholstery or for carpet cleaning. In addition to acid, citrus also contains oil which will leave a residue in your carpet or upholstery. Try a 50/50 mix of white vinegar and water for a homemade carpet cleaning solution. Ready to make your own homemade cleaning solution? Try slicing up 2 lemons and 2 limes. Soak them in a large Mason jar for a month in a dark place. After a month, strain the citrus out and pour the liquid into a spray bottle. Throw a few chunks of the citrus into the garbage disposal to freshen it up. Remember, test spot first, then clean. Use remaining citrus to freshen up your garbage disposal. Check out these simple Spring Cleaning tips. Two are great money and time savers, the other is just a fun and natural way to personalize your Spring Cleaning. 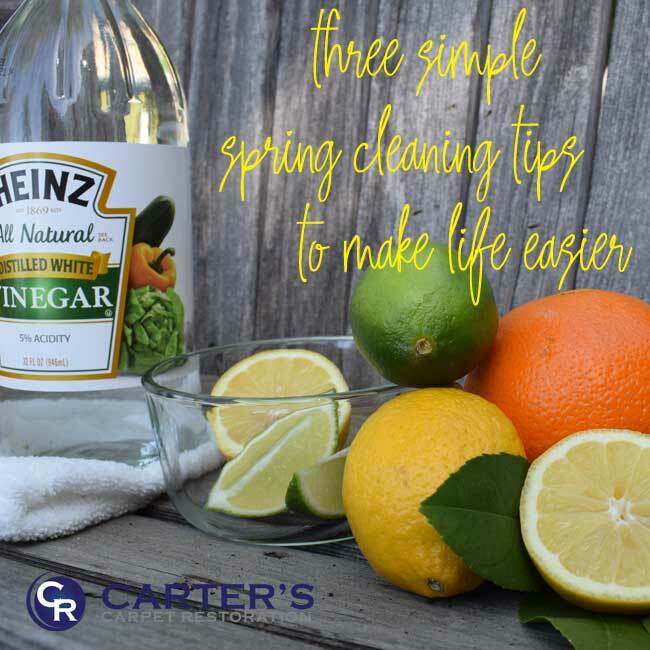 Three simple Spring Cleaning tips to make life easier. Save a few dollars with this Spring Cleaning Tip. Don’t purchase a special duster to clean the higher levels in your home, like cabinet tops and crown molding. Instead, try using a broom, rubber band and microfiber cloth to dust those taller spots. Simply cover the bristles of your broom with a clean microfiber cloth and secure it with a rubber band. Microfiber is an excellent dust catcher, and unlike some dusting products, it can be washed and reused time and time again. Remember not to use fabric softener when washing your microfiber towels, over time fabric softener will make them less effective in catching dust. 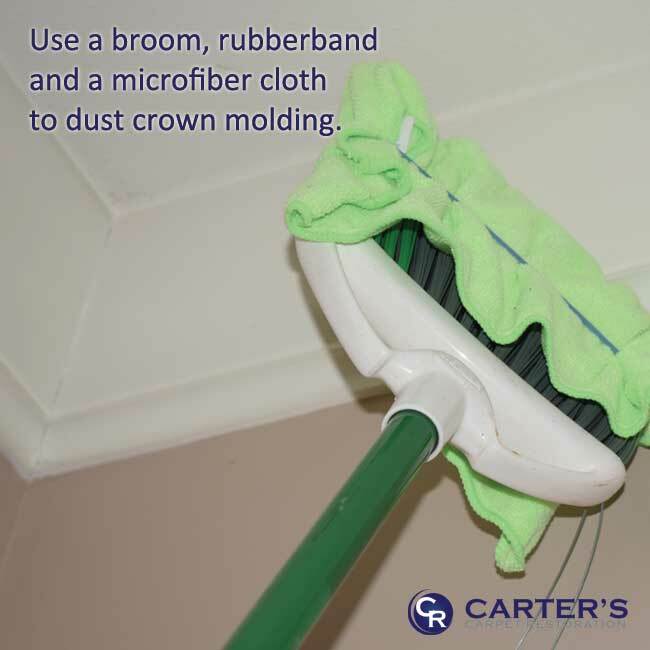 Use a broom, microfiber cloth and rubber band to make the ultimate cleaning tool for crown molding. Have you been thinking of making your own cleaning solution? It may not be easier, but it can certainly be rewarding. It’s nice to know that your cleaning solution is safe for your family, your pets, and your home. If you’re looking to experiment with a homemade cleaning solution, keep it simple and start vinegar and citrus. Combine sliced citrus and vinegar in a large mason jar, seal and store in a dark place for 2 weeks. After 2 weeks, strain the citrus out. Mix the citrus vinegar with equal parts water and pour into a spray bottle. Clean cautiously at first, high concentrations of acid from the citrus can discolor fabric and it’s not recommended for stone cleaning. Some people just soak the citrus rinds in vinegar to keep the acid level lower. Use citrus and vinegar to make your own cleaning solution. This next Spring Cleaning Tip is a true time saver, especially when you need to quickly freshen up upholstery. 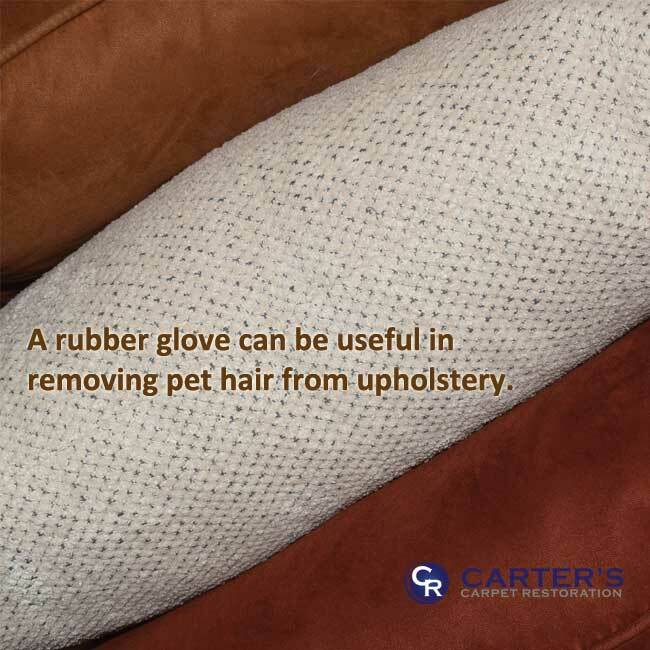 Rather than pull out your vacuum, try using a rubber glove to remove pet hair. Simply put on a clean, latex glove. The disposable kind is best, and it can certainly be reused for this type of cleaning. With medium pressure, move your gloved hand across the surface of microfiber cushions or standard upholstery. The pet hair should stick to the glove and easily lift off the upholstery. This is a great trick for dinette chairs, especially if you have a pet who likes to nap under the table. Tidy up any room by quickly collecting pet hair with a rubber glove. You can certainly save time and money with the right Spring Cleaning Tips. You can also personalize your cleaning with DIY cleaners. Enjoy the clean!